Josef Suk was a Czech violinist, violist, and conductor born on August 8, 1929 (Heifetz was 28 years old and would live an additional 58.) He is descended from two highly distinguished musicians – his grandfather, the violinist-composer Josef Suk, and his great grandfather, Antonin Dvorak. In Czechoslovakia, he was given the title of National Artist. His concert appearances in the U.S. were few and far between. He is well-known for having favored chamber music over solo playing. At the Prague Conservatory, his teacher (up to 1950) was Jaroslav Kocian. He also studied at the Prague Academy. While still a student, he joined the Prague Quartet as first violinist. In 1951, he formed the Suk Trio with cellist Janos Starker and pianist Julius Katchen (some sources say it was cellist Josef Chuchro and pianist Jan Panenka because the trio was initially begun with these artists.) His solo debut in Prague took place in 1954 and was very successful. It has been said that his worldwide tour with the Czech Philharmonic in 1959 was especially memorable. Suk recorded extensively for various labels – EMI, Decca, Naxos, and Supraphon, among others. Suk won the Grand Prix Du Disque several times – for recordings of music by Claude Debussy, Leos Janacek, Alban Berg, and others. He was once asked why he did not compose like his grandfather and great-grandfather - he said the following: "To be a composer after Dvorak and after Suk, I would have to be sensational. I don't have that sort of inspiration. I tried, but it wasn't that good so I stayed with my fiddle." He also founded the Suk Chamber Orchestra in 1974. Suk retired in 2004, at age 74, but, like Heifetz, did play afterward now and then. He even recorded in the year 2010. He was 80 years old. Suk played a 1729 Stradivarius, a 1744 Guarnerius, and a 1758 Guadagnini. There are many videos of his playing on YouTube. 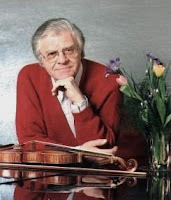 Josef Suk died on July 6, 2011, at age 81.